Average a smartphone or gadget can only survive about 8 to 10 hours with continuous use. This is maybe the following solutions could be an option for you when you are traveling using a motor and no power source for charging your gadgets. Yaaap USB charger motors, one of the devices that are functional when you are in need of electricity for charging your mobile phone. 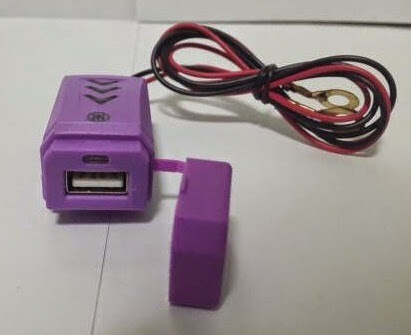 For those of you who do not know how to install the USB charger on the bike, here I review how to install USB charger on bike. 1. Buy a waterproof USB charger bike. Choose waterproof USB charger to keep from short-circuited when exposed to water. USB Charger motorcycles sold at a price of 30 thousand rupiah or 3.00 USD. 2. Prepare a place where you want to put the USB charge, try not to interfere with the rider and functionality of other components in the bike. Try to place USB charge close to the motorcycle battery. for example, you can place it on the dashboard or the bike wings. 3. Continue the installation process. installation is quite easy, you just connect the red wire directly to the battery and the black wire to the ground or the frame of the bike. if the cable is not long enough, you just connect it to another long cable. Keep cabling is neat. Slip or paste cable on motorcycle frame with masking tape. 0 Response to "How To Install USB Charger On Bike"